Announcing full advertising and marketing services! Do you have a restoration or other business in the automobile industry? Perhaps you are trying to promote or sell a vehicle, or an entire collection! 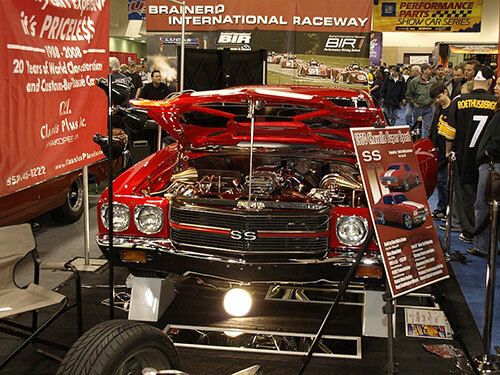 Are you considering selling at Barrett Jackson, RM or one of the other auction venues? Are you interested in having your car featured in a magazine? Custom Show Boards has a marketing strategy that's a perfect and affordable investment designed just for you! In addition to my already popular Custom Show Boards, I can create for you posters, postcards, trading cards, business cards, and calendars. 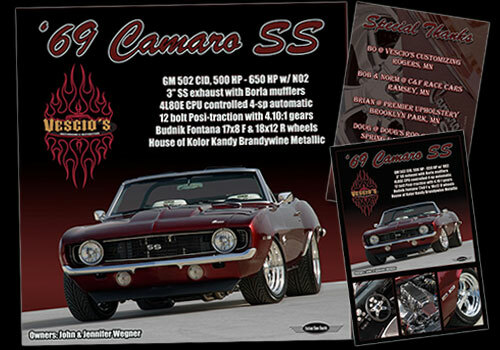 Use them for customer appreciation, car show goodie bags, or to advertise your business or collectible for sale at car shows and other special events. Sellers & Dealers: Stand out from the rest during preview days for the large auctions with double sided full color, high quality photo cards that your bidders will take with them and review over and over again as they decide how to spend their money. When bundled with one of my Custom Show Boards, the eye catching quality and pricing of these materials cannot be beaten or ignored. During the first few months of offering this service, my Custom Show Boards and Show Cards have helped market and successfully sell over 1.6 million dollars worth of vehicles at auction, including 3 record setting hammer prices! Restorers: Give your customers the ultimate product that actually pays you back! Provide them with a Custom Show Board and promotional material that highlight your services! Let them proudly advertise for you when they set up their vehicles at shows and hand out cool collector cards with your business name on them. Everybody benefits from this strategy. 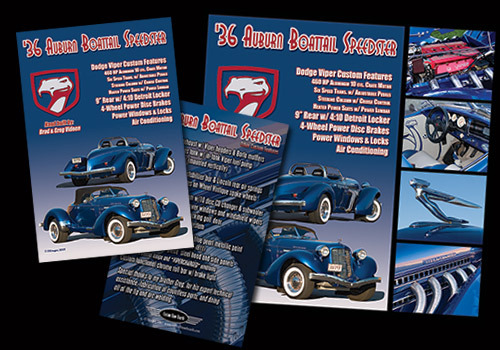 Custom Show Cards - "Rally Pack"
Available as mail-ready cards or double sided advertising or promotional cards. These are a very cost effective and high impact strategy to advertise at any event or place of business. People will never want to throw away this card, but will probably want to display it. These are HOT and are an awesome value! Pricing for 1000 double sided cards starts at $150. Other quantities available. Please email or call for a custom quote. I only print with the highest quality card stock, inks and coatings I can find. 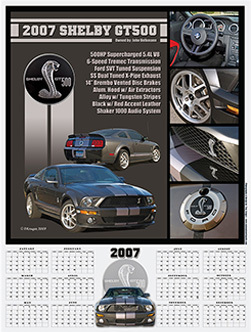 Your promotional posters or 18x24 wall calendars will last for years without even needing a frame. The quality is simply amazing. These make great gifts for friends, family and car club members! Pricing for 100 calendars starts at less than $5 each. Other quantities available. Please email or call for a custom quote. Choose single or double sided: Either way, you won't find a more appealing and sturdier card anywhere. I provide design services based on elements from your Custom Show Board and other text you supply for me to integrate. Pricing for 5000 units starts at less than $.05 each Other quantities available. Please email or call for a custom quote. 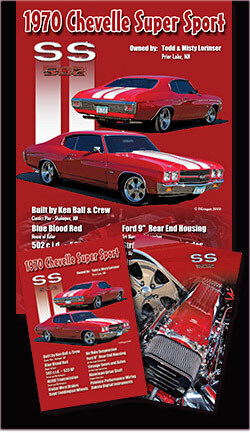 Get the ultimate display for your next car show or auction sale. Please email or call for a custom quote. *prices subject to change. Marketing products only available with same front design as Custom Show Board purchase and are priced accordingly. Additional design fees apply for significant design deviation from board images. Add 7.275% sales tax for MN customers. Shipping and handling charges may also apply.